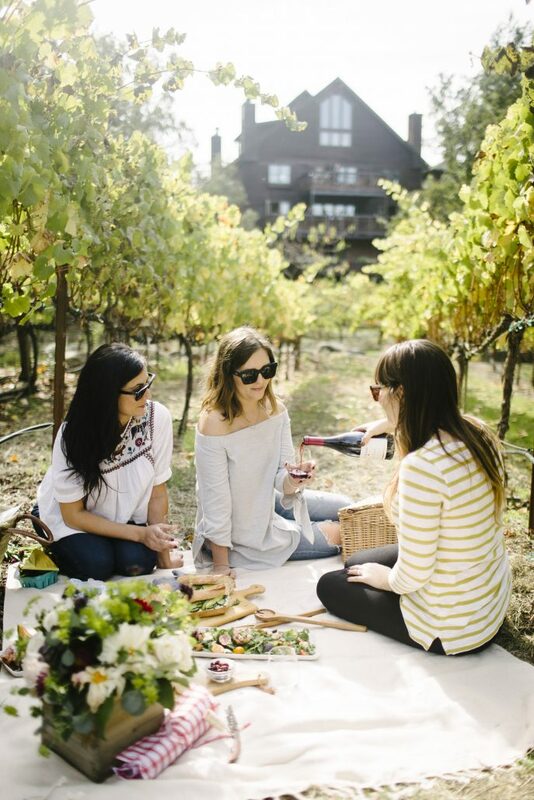 What better way to enjoy a beautiful day outside than with a wine country picnic? 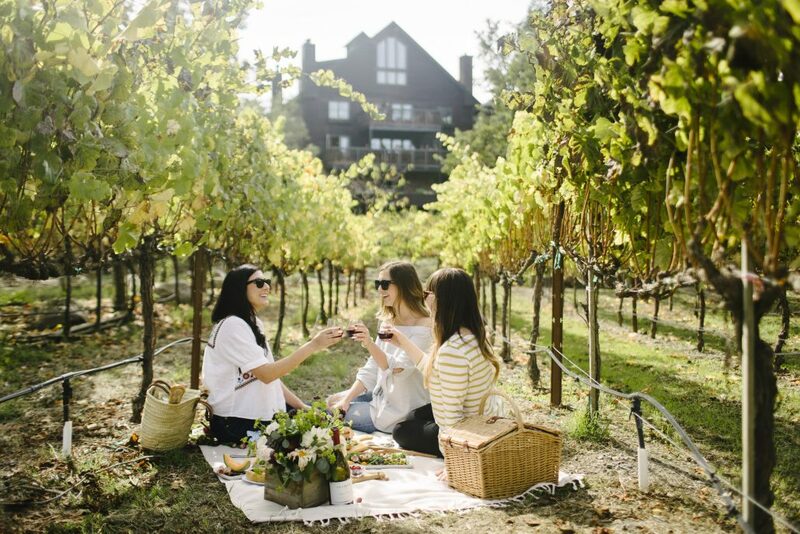 At our La Crema Estate, we have scenic spots all over the property that are perfect for an afternoon of toasting and tasting. 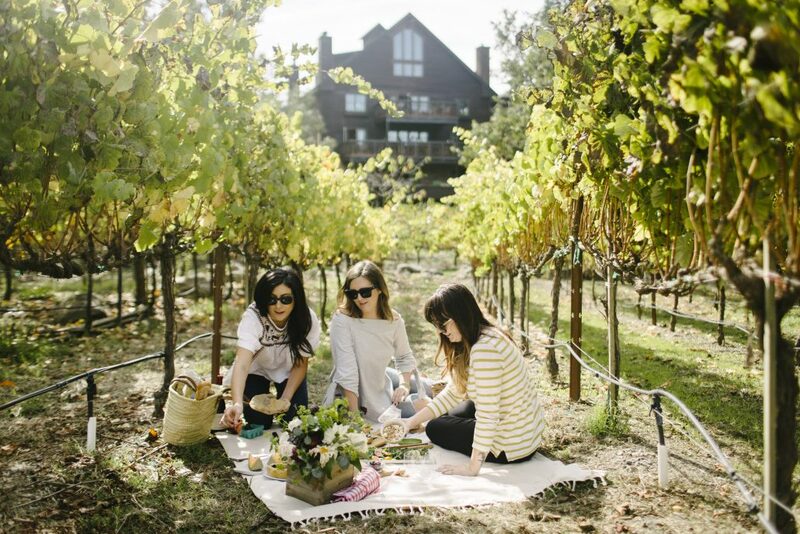 After helping host our Autumn Lunch a few weeks ago, we asked our blogger friends Megan of Freckled Italian, Kristan of The Broken Bread, and Annie of Annie Reeves to join us for a wine country picnic and share their best tips for making the most of the day! First, you’ll want to gather all necessary supplies. 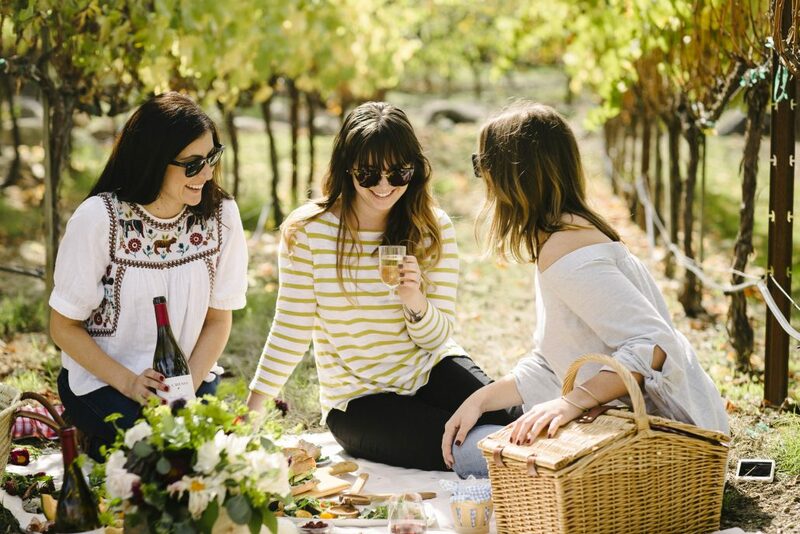 For a wine country picnic, that means a big blanket, lots of seasonal, simple foods for snacking, and, of course, a few bottles of wine. 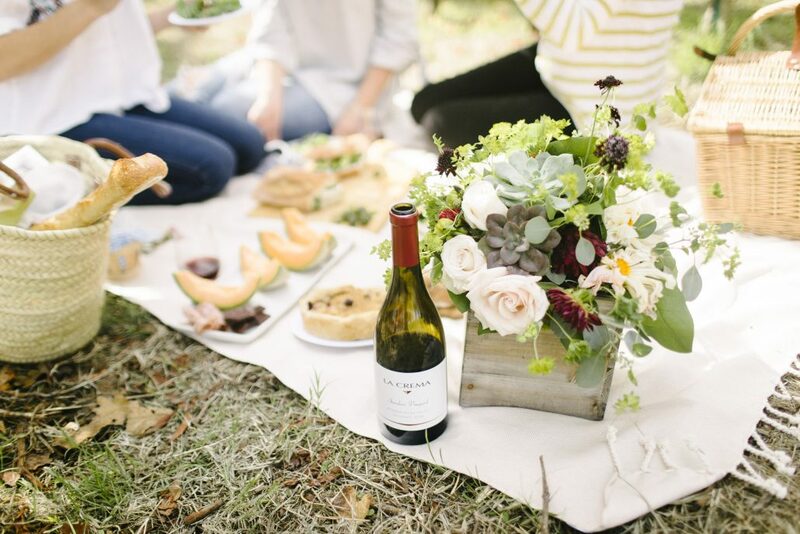 Since we were picnicking in Saralee’s Vineyard, it only felt right to drink the Saralee’s Vineyard Pinot Noir and Chardonnay amongst the vines that produced them. On our way to the La Crema Estate, we stopped at a nearby market to gather the food we needed for the day. We chose ingredients that didn’t require a lot of prep work, then elevated them into something special. Our herbed sandwich spread only required a package of cream cheese, some fresh dill, a slice of lemon, and a knife or spoon for mixing. Keep it simple. Focus on what’s in season and make the most of it. Pick a few things so you don’t get overwhelmed with planning, setup, or cleanup. 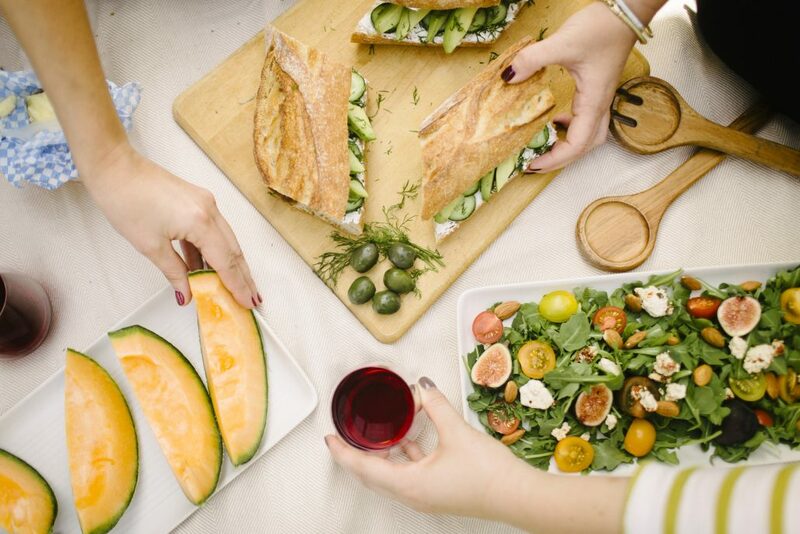 We chose a sandwich for our main (see recipe below) and also picked up some greens, cheese, bread, and seasonal fruit. 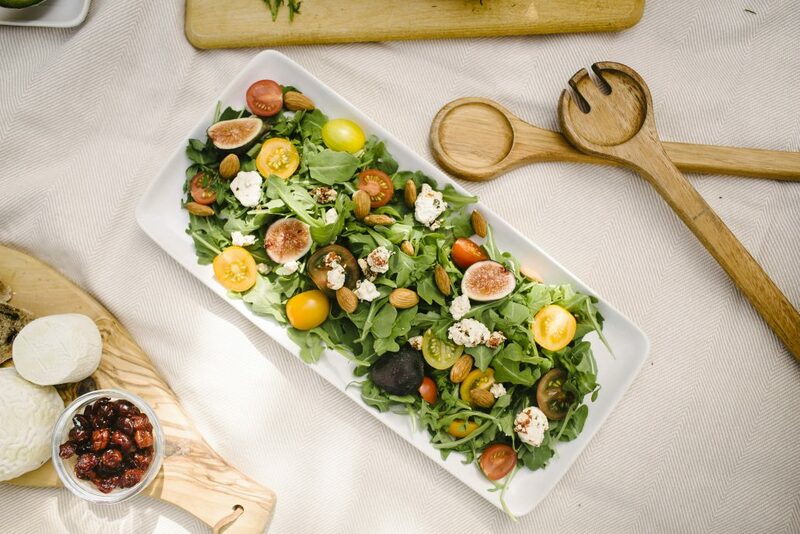 Our salad consisted of arugula, figs, herbed goat cheese and some gorgeous tomatoes, which were simply lovely with a drizzle of olive oil and a squeeze of fresh lemon juice. Pick a large enough basket, like this one that Hayneedle so kindly provided us with. That way, you aren’t carrying a bunch of things or making multiple trips to the car. 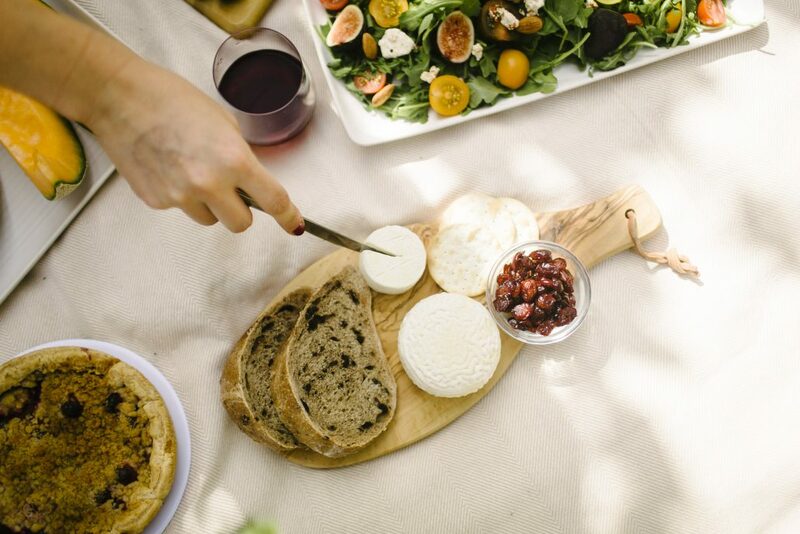 A tray will make serving wine and steadying plates much easier than trying to balance them on the picnic blanket. Packing a cutting board and a knife is also great for any last-minute prep and serving. Pick the right spot. Find a place to enjoy a meal that gives you a great view and enough shade to comfortably enjoy your time outdoors. Don’t forget your wine opener! 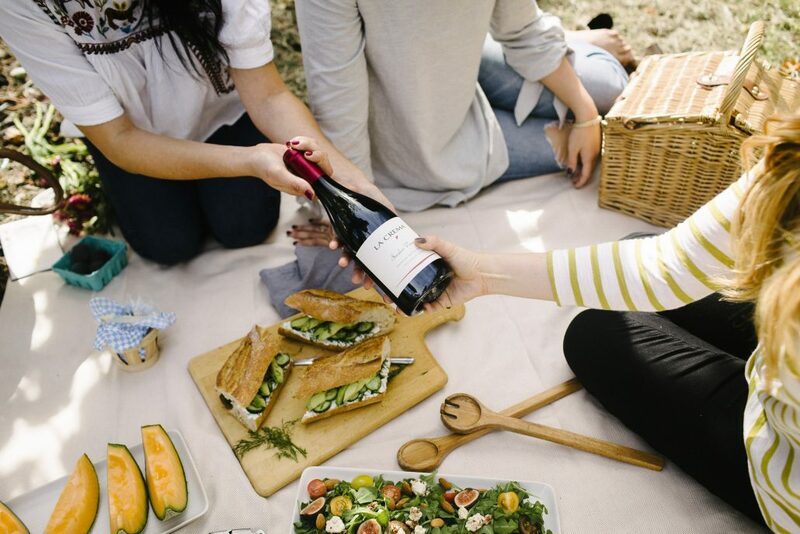 There’s nothing worse than getting to your picnic spot and not being able to open the wine. Although, if you’re at La Crema, there are plenty of them available for purchase inside. Slice the baguette into 4-5 equal sized pieces. Cut each piece in half from top to bottom, making sure not to cut all the way through the bread; set aside. In a medium bowl add the cream cheese, 3 tablespoons of finely chopped dill (or more if desired), and a light squeeze of lemon juice; mix to combine. Taste, and add extra lemon juice if needed, and salt and pepper to taste. 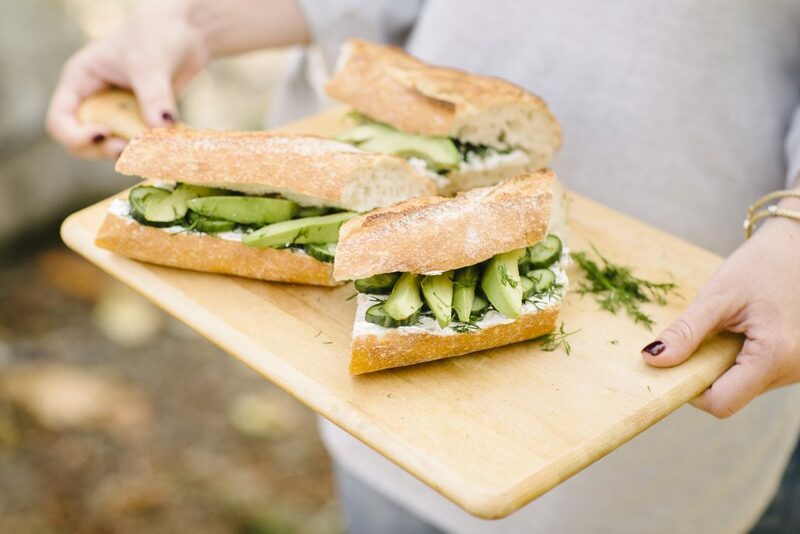 Spread desired amount of herbed cream cheese onto each sandwich followed by a layer of cucumber and avocado slices. Garnish the sandwiches with a bit of extra dill and a light drizzle of olive oil. There’s still plenty of time to take advantage of the nice weather and fall foliage before winter sets in. 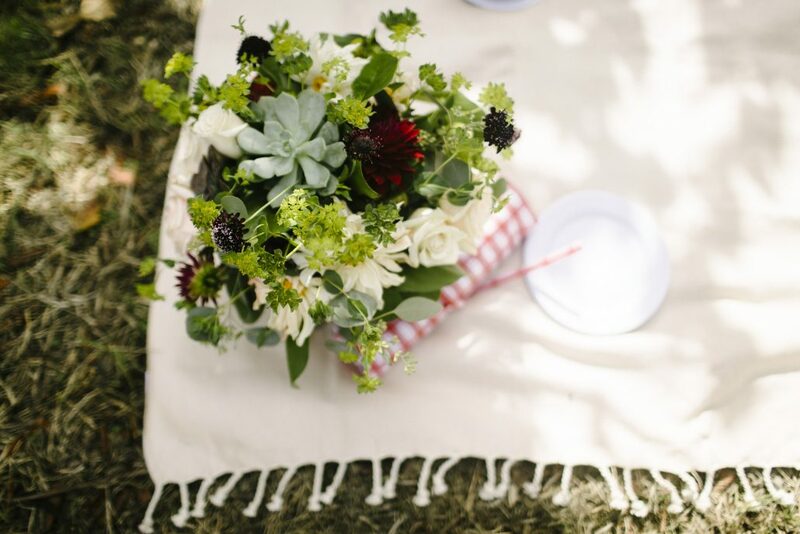 Why not try to enjoy a picnic of your own? 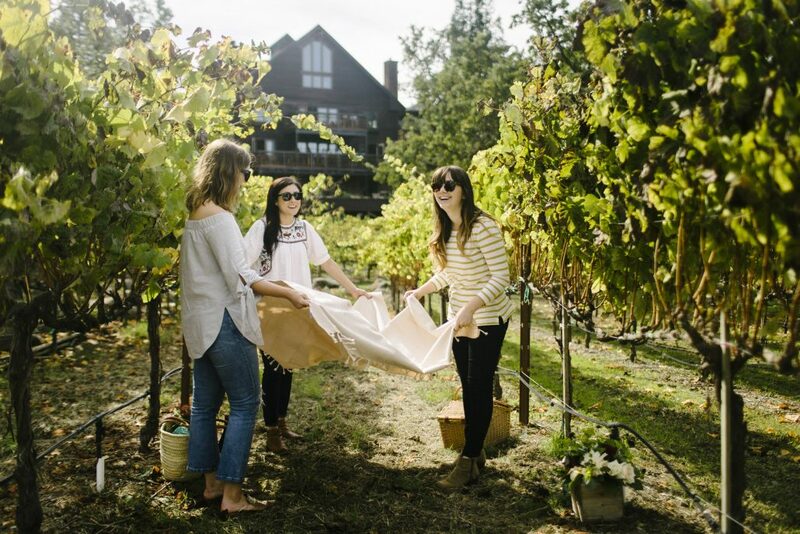 Whether you’re in a vineyard, or in the comfort of your own hometown, we can all agree that a meal spent outside with a glass of wine is one of the best ways to spend an afternoon. Lush. Fruity. Intense Undoubtedly the heart of Russian River Valley, Saralee’s Vineyard encompasses rolling vineyards, rustic charm and magical fruit.